Posted October 23rd, 2010 at 9:43 am | Log in to reply. What is the other leaf you used (the flat one, not the lettuce)? I can’t quite understand. My audio here is a little buggy :) Thanks, Maangchi. Posted November 7th, 2010 at 6:52 pm | Log in to reply. The leaf that’s kind of a flat round shape is called Perilla leaf. I think it’s called kkaennip in Korean. In Japanese, it is called shiso. Posted November 7th, 2010 at 10:32 pm | Log in to reply. Posted September 29th, 2010 at 1:24 am | Log in to reply. Is it okay for me to use pork side for this recipe? I read online that it’s the same thing?? Thanks! Posted September 29th, 2010 at 2:13 am | Log in to reply. 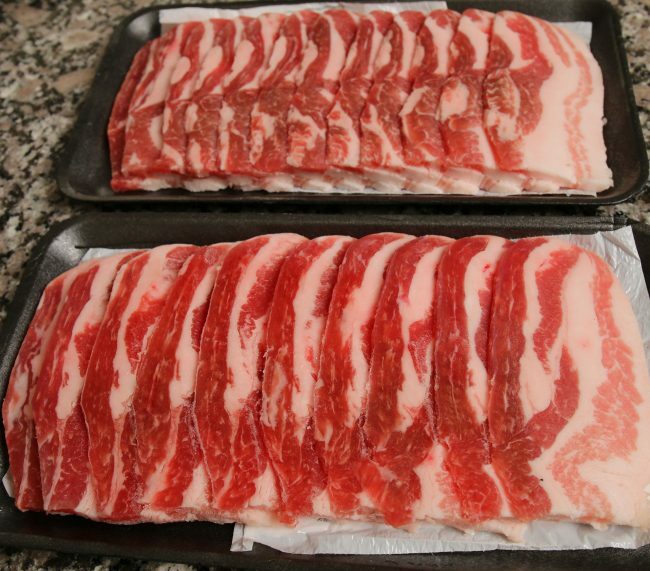 yes, pork side or pork shoulder with this recipe will be yummy! Posted September 25th, 2010 at 10:20 am | Log in to reply. I made this the other day and it came out great!!! But would like dial back some of the spiciness for some of my friends. What would be the best way to reduced the heat? skip hot pepper flakes then. Posted September 13th, 2010 at 10:07 pm | Log in to reply. Maangchi! I wish I could give you a BIG Thank you HUG for all the wonderful recipe post. Jeyuk Bokkeum is my favourite Korean dish. Posted September 14th, 2010 at 1:57 pm | Log in to reply. Wonderful! A big hug for you! Posted November 8th, 2010 at 9:46 am | Log in to reply. Posted September 12th, 2010 at 9:01 pm | Log in to reply. 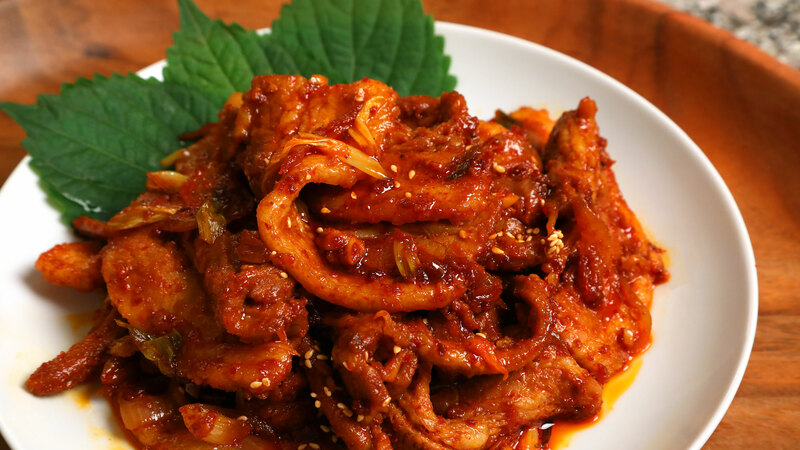 Yesterday i went to H-mart and had this “spicy pork and squid” that was super good. I think it was kinda like a slow poach of pork and squid with a lot of spicy sauce. I was determined to re-make it! So today I used your recipe (with pork shoulder and squid), made it a little bit more liquidy with more soy sauce and sugar, and cooked/poached it longer. Guess what, it tasted almost the same haha i’m so happy! Posted September 12th, 2010 at 11:39 pm | Log in to reply. Posted September 10th, 2010 at 6:10 pm | Log in to reply. this looks sooo good! I want to make this for my boyfriend on our 4th year anniversary. but my boyfriend doesn’t like garlic. What can I use to replace garlic? Posted September 11th, 2010 at 11:57 am | Log in to reply. Posted September 10th, 2010 at 3:37 pm | Log in to reply. This is one of those recipes my mom would never tell me for some strange reason… but it’s just like she would make!! If she couldn’t get the pork belly then she would use pork loin and even add rice cakes. Thank you!!! Posted September 11th, 2010 at 11:58 am | Log in to reply. I’m glad you like this recipe! Adding some rice cake sounds good to me. Actually you could stir-fry kimchi with this, too. very delicious. Posted September 5th, 2010 at 7:01 pm | Log in to reply. This was soooo good! I couldn’t find pork belly so I used pork shoulder. It was still amazing! Posted September 5th, 2010 at 12:36 am | Log in to reply. Posted September 5th, 2010 at 8:53 am | Log in to reply. You could marinate it before cooking, but this way is much simpler and easier and more delicious. When you do charcoal bbq, you will have to marinate it. Posted September 5th, 2010 at 8:58 am | Log in to reply. Posted September 5th, 2010 at 12:06 am | Log in to reply. If I dont have hot pepper paste, Can I substitue wit something else? Posted September 5th, 2010 at 8:55 am | Log in to reply. Maybe use more hot pepper flakes? If you use only hot pepper flakes, use some soy sauce. The amount of soy sauce depends on your taste. Good luck! Posted September 4th, 2010 at 12:05 pm | Log in to reply. Maangchi, my local store didnt carry pork belly. Would it be ok to use ground pork instead? Posted September 4th, 2010 at 7:52 pm | Log in to reply. If you used ground pork, when it’s cooked the pieces will be very extra small. It might be harder to eat it this way, but if you’re okay with having very small pieces it might be okay to try it with ground pork. Posted September 4th, 2010 at 9:09 pm | Log in to reply. Thank you very much for the info. I’m going to go to a different store to find the pork belly. If I still cant find it, I will use the pork shoulder. Posted September 4th, 2010 at 9:09 am | Log in to reply. I’ve made this recipe for breakfast since I’ve all the ingredients in my fridge! yum!! it’s better than the spicy pork korean bbq that i’ve eaten. Anyway, I’ve eaten this recipe, but with chicken instead. Am wondering, if i just replace pork with chicken breast, is it still delicious? Posted September 4th, 2010 at 10:48 am | Log in to reply. I think chicken breast works well with this recipe but add some vegetable oil so that it won’t burn. Posted September 4th, 2010 at 12:30 am | Log in to reply. Hi Maangchi, If someone is vegetarian, which protein do you recommend? Posted September 4th, 2010 at 9:49 pm | Log in to reply. Maangchi, do you mind if I reply? My first choice would be a imitation pork wheat gluten, which is a Taiwanese product sold in a blue can at Asian markets. It needs a lot of oil and/or a nonstick pan to not burn. Large health stores (or grocery sections) often stock fake meats. Otherwise, smoked tofu, wheat gluten/seitan, firm tofu, or yuba (dried bean curd skin) are other options. This recipe is highly spiced so you might not need yo compensate for the added pork taste. Posted September 4th, 2010 at 9:59 pm | Log in to reply. Thank you very much! I didn’t know the answer so I was quiet! “imitation pork wheat gluten” I should try it out someday. Posted September 3rd, 2010 at 2:37 pm | Log in to reply. Thank you, thank you for another recipe with perilla leaves. I can’t wait to make this next week. Posted September 4th, 2010 at 6:35 am | Log in to reply. Posted September 3rd, 2010 at 12:53 pm | Log in to reply. I’m so excited about this recipe, you have no idea. I’ll get started on it as soon as I have the pork I need. Posted September 3rd, 2010 at 1:33 pm | Log in to reply. Will, “you have no idea”, are u kidding? I was thinking about you when I posted this recipe this morning because I knew you would like this dish. Posted September 3rd, 2010 at 11:02 pm | Log in to reply. I was so excited to make it that I just couldn’t wait. I left immediately for the grocery store to get pork and lettuce. And then I went to my favorite pan-asian grocery store “United Noodles” and bought a new tub of gochujang. I made it for dinner for my family tonight! It was so delicious. Just like I remember from the Korean restaurant on campus. In fact, I’ve already emailed you some photos of it. 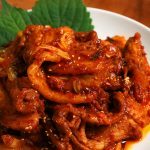 I think that this spicy pork might be a good filling for kimbap too, with a little chopped kimchi added. Maybe I’ll do that for a labor day picnic with the leftovers? Posted September 4th, 2010 at 6:38 am | Log in to reply. The video was watched 541,058 times on YouTube & has 14,997 likes! This video is a remade version of an earlier recipe. The original video was posted on 2010-09-03 and has 1,596,758 views.